Ryan Pendleton is sales and marketing manager, Beckwood Press Company, Fenton, MO: 636/343-4100, www.beckwoodpress.com. Steelville Manufacturing employs this new Triform 24-5BD sheet hydroforming press to form a seven-bend part in less than one-fourth the time it would have taken in a press brake. The press features a 24-in.-dia. forming area with a maximum forming pressure of 5000 PSI. You upload the supplied CAD data and material specifications into your forming-simulation software. During the next 2 hr., your engineers develop, simulate and refine the tooling design, flat-pattern design and forming-process variables. To address the tendency for the material to tear, they modify a tool radius and identify the ideal pressure for preventing wrinkles. All of this occurs before manufacturing a single tool or cutting a single flat pattern. By 4:30 p.m. you’re ready to make the tool and cut the engineered blanks. Engineers export the tool design generated within the simulation software to an inhouse 3D printer. The printer goes to work, building up the tooling layer-by-layer with high-performance material designed to withstand the intense forming pressures associated with sheet hydroforming. The print job continues through the night via lights out manufacturing, and is ready for work by the time you return to the plant the next morning. Time to load the tool and blank, and then program the forming procedure. You cycle the press with confidence, and the tool and blank designs that were optimized during simulation perform as planned. After a fast 8-sec. press cycle, you remove the fully formed part from the press. It’s 9:00 a.m. and you’re ready to begin sending the parts to shipping, and out to your customer. Facilities with access to forming-simulation software and 3D-printing technology can leverage the tool geometry, refined during the simulation process, for use in their 3D printer. 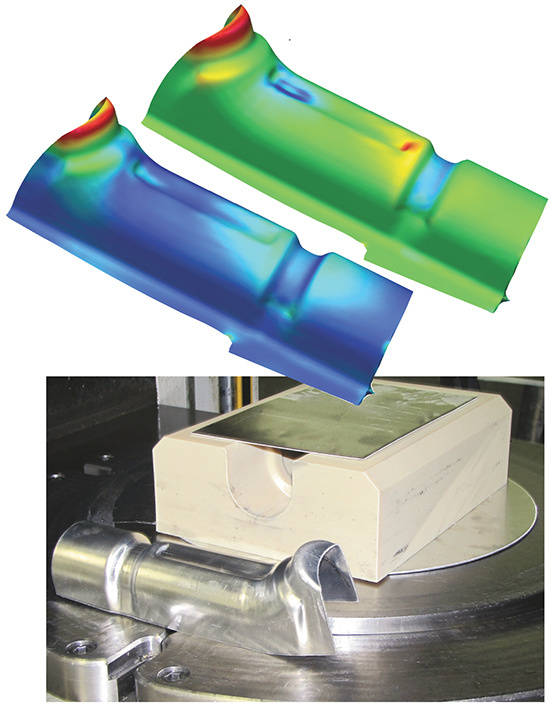 Shown is a Pam-Stamp forming simulation of an aluminum exhaust part, and the resulting tool and sheet-hydroformed part. The tool (5.5 in. long by 2.25 in. wide by 1 in. tall) was printed in 12 hr. on a 3D Systems ProJet machine; material cost, $57.50. The collective power of advanced simulation software, additive-manufactured (3D-printed) tooling and sheet hydroforming provides the above-noted (and other) competitive advantages to metalformers. Alone, the individual technologies can be powerful tools for any modern metalforming facility. But when used together, the three technologies create an ecosystem that supports rapid part development and inexpensive low- to mid-volume part production (see the accompanying sidebar for a case study examining how one metalformer does just that). Forming-simulation software has fundamentally altered the engineering process, allowing users to predict a host of real-world scenarios that in turn influence and improve part and die design. The ability to simulate the forming process virtually, with confidence that the simulated result will closely mirror the actual forming result, has become an indispensable tool for many. Users input into the software standard CAD data, properties of the material being formed and the forming strategy, including drawing, stamping, bending, sheet hydroforming and others. In addition to lowering costs by eliminating immature form blocks and flat patterns from the scrap bin, forming-simulation software also can aid the part-quoting process. Here’s another example of marrying forming simulation and 3D printing of hydroform tooling. Shown are Pam-Stamp models (thickness and major strain) of a formed aluminum (6062-O, 0.040 in. thick) heatshield, and the resulting 3D-printed form block created on a Stratasys Fortus 400mc printer. 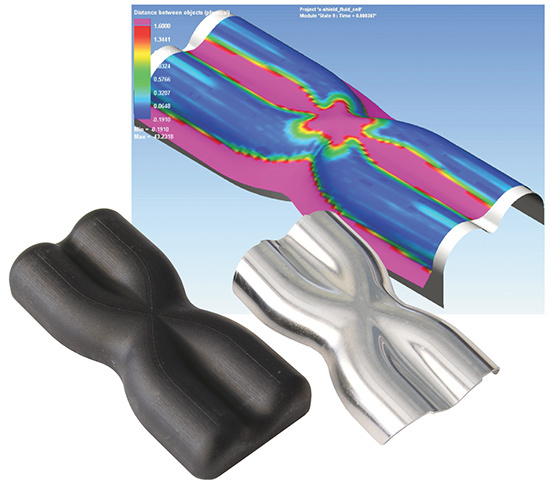 Powerful forming simulation suites also offer inside looks at valuable forming-process data. These insights can include material thickening and thinning diagrams, strain charting, force/pressure curves and measurements showing the distance from the material to the tool’s surface at any chosen location. Facilities with access to forming-simulation software and 3D-printing technology can leverage the tool geometry, refined during the simulation process, for use in their 3D printer. The CAD data transfers wirelessly to the 3D printer, which converts the digital data into a three-dimensional object—layer-by-layer. Specific to additive-manufactured tooling for use in sheet-hydroforming operations, recent advances in print materials and processes have resulted in durable tooling able to withstand high forming pressures. 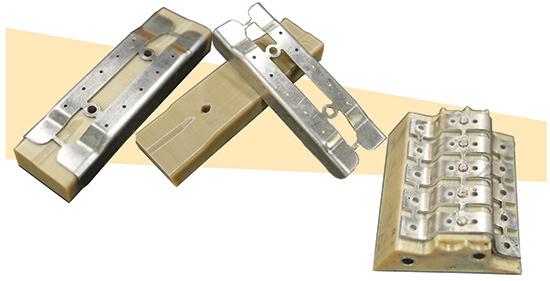 Sheet hydroforming often allows for the formation of multiple parts in a single press cycle. Shown are sheet-hydroformed parts and their related 3D-printed tools, manufactured from Ultem 9085—a high-performance fused-deposition-modeling thermoplastic from Stratasys. The material can withstand hydroforming pressure to 20,000 PSI. While tool life hinges on several factors, including the 3D-printing medium, forming material and forming pressure, tools commonly last for hundreds of cycles before showing signs of wear. Dimensional accuracy reaches ±0.005 in. The advantages associated with 3D-printed tooling revolve primarily around savings in cost and time. Additional benefits include lighter, more ergonomic tools that improve operator safety. The 3D-printing process also supports repeatable tool creation without the need for third-party suppliers. Secondary tooling, such as drill and trim tools, as well as check fixtures also can be eliminated. In March 2014, Steelville Manufacturing Co., a contract machine shop specializing in milling, turning, waterjet cutting and metalforming, took delivery of a new sheet hydroforming press (a Triform 24-5BD from Beckwood Press Co.) The bladder forming press features a 24-in.-dia. forming area with a maximum forming pressure of 5000 PSI. This multistep forming process proved time consuming and expensive. In addition to increased engineering requirements, Steelville’s traditional methods also required considerable CNC labor and machine time. Its manufacturing team would have to design and manufacture mating dies for those parts which could not be press-brake formed, and those parts which were eligible for press-brake forming often would require multiple hits in order to fold multiple flanges on a single part. “Now, we can use the Triform to form a seven-bend part in less than one-fourth the time it would have taken in our press brake,” says Dust. While Steelville can create a single tool using poured epoxies and traditional machined materials, it has been an early adopter of 3D-printed tools. 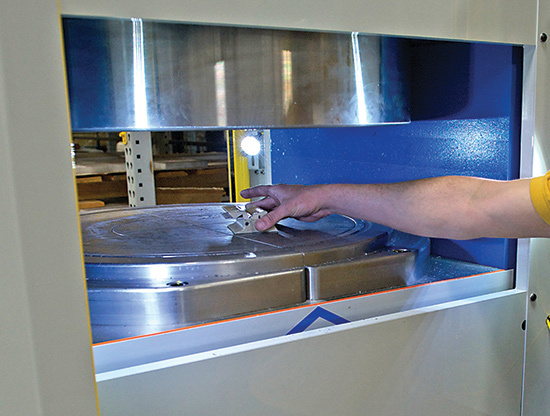 By using 3D printing to produce form blocks, Steelville bypasses its machining centers all-together. This collaboration between 3D printing and sheet hydroforming has dramatically shortened turnaround time for new-part production, while driving down overall cost per part. The last leg of our journey involves sheet hydroforming—forming sheetmetal using a flexible rubber diaphragm or bladder against a single tool or form block. Hydraulic fluid pumped into the bladder pressurizes it to supply a significant and evenly applied force on the entire part surface. Because the bladder acts as a universal die half that conforms to any shape within the forming chamber, only a single tool half is required—traditional matched die sets are eliminated. Sheet-hydroforming tooling can be produced quickly and inexpensively from a variety of materials, including steel, aluminum, poured epoxies, wood and, of course 3D-printed materials. This dramatically improves new-part development time and lowers overall process costs, making sheet hydroforming ideal for rapid prototyping and short- to medium-volume production.